A 29-year-old Foodpanda delivery rider was taken to hospital after he was involved in an accident with a BMW car along Sixth Avenue on Saturday afternoon (Jan 26). 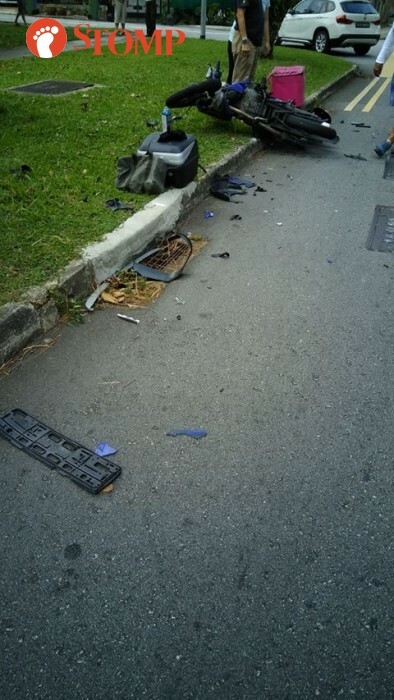 Stomper Dalisa alerted Stomp to the accident and shared photos she took at the scene. The rider was seen lying on the road while his bike was seen metres away from him and debris was scattered around the area. In response to a Stomp media query, the police said they were alerted to the accident at about 3.10pm. The motorcyclist, a 29-year-old man, was conscious when he was taken to National University Hospital.